I met one of my writing friends, Cecilia, at a series of workshops run by Jo Parfitt in The Netherlands a few years ago. Titled The Naked Writer, it consisted of six workshops where we delved deeply into our being to write from that space. 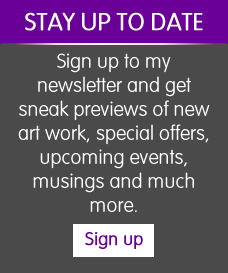 I learnt a bit about crafting stories as well as allowing myself to write more freely and with more vulnerability. 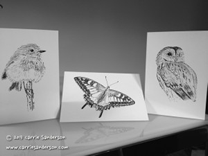 I really enjoyed those workshops. Cecilia and I have tried a few times to meet up in the last few months to a year, but often I run out of time when I visit my family in The Netherlands – too many things to do or people to see, and of course I am there for a break as well. So when Cecilia said she was coming over to Scotland to teach workshops I knew this would be a good chance to finally meet up. Plus she was only going to be “over the bridge” in Fife and was planning a visit to Edinburgh. We met in front of Holyrood Palace after lunch on a bright Wednesday afternoon in July and it was lovely. Like time had not passed. I met her beautiful “husky ladies” as she calls them, Elsa and Akasha, as well as her husband, Wouter, and friend, David, who lives in Fife. 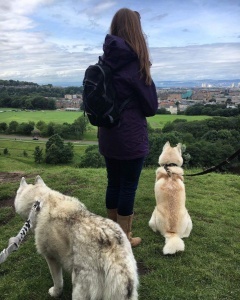 The four of us and the two husky ladies headed to Holyrood Park and St Margaret’s Loch for a wander, all the while showing them the beauty of Arthur’s Seat, Salisbury Crags and Holyrood Palace, one of the Queen’s properties. I didn’t realise there was a garden party at the Palace that day. I thought it had been the day before as someone I knew had been invited to it and I’d seen her photos on Instagram. We did a little bird-watching at St Margaret’s Loch, a place where I’ve often visited to study the herring gulls and pigeons for my art projects. It’s also a lovely spot for some moments of serenity and tranquility amidst the buzz of the city. My little sanctuary. I had a feeling my friends would love this spot as they are fellow nature lovers. At one end of the loch, a couple and their child were feeding the birds and it quickly became a frenzy, pigeons and gulls darting to the scene to grab whatever they could from them. 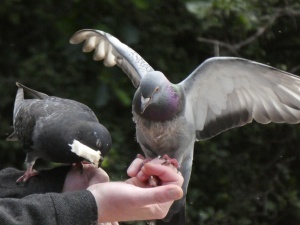 The man was holding out his arms, and first two pigeons came and sat on them, pecking at the bread, then later I spotted he had at least five pigeons balancing on his arms! It was pretty intimidating standing nearby and watching it unfold as the gulls would swoop in close over the top of us and almost dive beak-first in to the quagmire. I didn’t want to get in the way of that! Meanwhile, I’d spotted a young heron along the shoreline further around from where we were standing, soon joined by a second one who slowly crept along the water’s edge to get closer to the action and perhaps seeking some food, too. 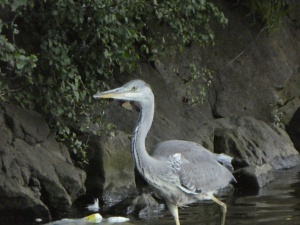 It looked as if the heron was tip-toeing like I did when I was a child coming down the stairs at night when I was supposed to be tucked up in bed. It was amusing to watch. After observing the antics and taking multiple action shots, we continued our meander up the side of the hill by the loch where we had a 180 degree view of the city, stopping by the ruins of St Anthony’s Chapel to breathe it all in. 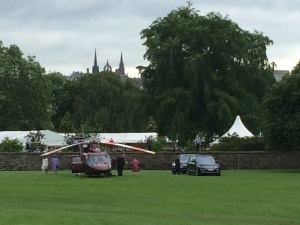 Then we walked back down and across the green field, part of which was being used as a car park for the Queen’s garden party, when suddenly we first heard, and then saw, a helicopter. We thought it was security but then I spotted a guy on the ground waving his hands and I thought, “Hang on a minute, it’s going to land…maybe it’s the Queen…?”. It was such a coincidence and the timing couldn’t have been better. We got closer to the perimeter the police had set up so the helicopter could land. We watched the whole thing unfold, the Queen stepping out of the helicopter once it’d landed and then she got into one of the two black Landrovers that were parked a few metres away. They would take her through the front gate of the Palace, no doubt to go and greet the party goers inside the walls of the Palace grounds. Prince Philip was by her side as were a couple of other people I didn’t recognise and a few smartly dressed security people. My friends were ecstatic! An unexpected gift that added so much delight to their visit to the city. What’s more, we had been joking moments beforehand about going for a cup of tea somewhere and we thought we’d ask Lizzy – aka Queen Elizabeth – if we could join her. It was as if she’d heard our proposition! As if I’d organised this so my friends could see her; we couldn’t stop laughing about it. I jokingly added I’d secretly sent a WhatsApp message to Lizzy to tell her we were T minus 5 minutes away and she had heeded my request to land as we approached, a special surprise for my guests. After the two Landrovers had taken the royalty away, we walked along the perimeter to get closer to the rather luxurious-looking helicopter and we still couldn’t stop laughing. We were like a bunch of giddy, school kids. A man who was drawn to the husky ladies came up to us and we had a chat, showing each other photos of the helicopter landing, pointing in the photos to who the Queen was (he’d thought it was the lady in blue, we said it had been the lady in pink/burgundy. By the way, she’s tiny!). 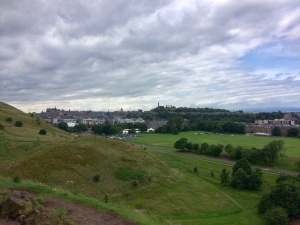 We headed up the Royal Mile, a famous mile-long stretch of road between Holyrood Palace and Edinburgh Castle, to find somewhere for a cup of tea – since Lizzy was too busy with her garden party – and found Café Truva where we could sit outside and enjoy a hot drink. Not only was the Queen the star of the show that day, so were Cecilia’s husky ladies – everywhere we went people’s faces would light up upon seeing them and I heard lots of them say how beautiful or lovely they were. Elsa and Akasha were certainly sprinkling joy into people’s hearts wherever we went. After we paid for our drinks we hugged goodbye and the gang took the train back to Fife and I walked home. It had been a wonderful afternoon full of synchronicities, coincidences and laughter. Life unfolds in truly magical ways when you let it. It’s times like these, these simple pleasures, delights and encounters that spark my soul to shine, that make life beautiful and amazing for me. And I choose to seek and create these more and more, every single day. Because beauty is everywhere, and it feeds my spirit, my well-being, my life. What feeds your spirit, well-being and life?